Drexel is a demon loyal to Lucifer who aided in his release from Crowley's imprisonment. Drexel meets with Lucifer in secret as Crowley is making his rounds. He inspects Lucifer’s vessel, assuring the archangel that his body's restoration is holding and his vessel should be able to contain him without issue. When Lucifer questions Drexel about the warding that has been put in place, Drexel hesitates in telling him whether he is able to power it down. Lucifer grabs him by the throat, choking Drexel, who tells him he doesn't have the means to do that as a demon by the name of Spivak was the one that set the system up, but Spivak was killed by Crowley to safeguard its secrets. Lucifer asks Drexel if he can crack it, to which Drexel nervously replies he can, but he'll need some time. Drexel sneaks into Lucifer's prison cell and does an examination of his vessel. Lucifer, impatient, tells Drexel he wants to leave. But Drexel tells him he can't do anything until he fully shuts down the security system that keeps Lucifer in Crowley's control. Lucifer tells him he'll take his chances when they hear Crowley's voice in the distance. This prompts Drexel to hide behind the door as Crowley enters. Emerging after Crowley has taken his leave, Drexel reiterates to Lucifer the importance of fully shutting down the security, otherwise Crowley's hold has a chance of increasing. Aggravated, Lucifer brings Drexel closer to him and tells him to check again. 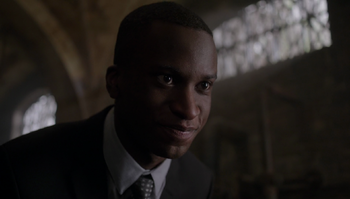 As Drexel starts another examination, he is shocked to find that the polarity has reversed, and that the spellwork connecting Lucifer to Crowley now gives Lucifer full control over Crowley, much to Lucifer's delight. After Lucifer takes over and is believed to have murdered Crowley, Drexel is present with other demons who are cleaning up the throne room on Lucifer's orders. Upon being asked what to do with Crowley's deceased meatsuit, Drexel tells two demons to "toss it." A drunk demon mocks Drexel for trying to protect the throne, lamenting that they are done. Ever the believer, Drexel tells the demon that Lucifer promised he would return and make Hell great again. He receives only a snide response from the demon in turn. Suddenly, the doors to the throne room swing open and the halls fill up with white light and a man walks through. Hearing the name Asmodeus, Drexel realize he is the fourth Prince of Hell. Asmodeus declares his intentions for Hell, calling forward Drexel and two other demons before killing everyone else in the room. After Drexel reveals he and his demons have been unable to locate Lucifer, Asmodeus orders Drexel to shift focus to Lucifer's son, who is to take his rightful place on Hell's throne. Drexel takes notes, remarking he will continue searching for Lucifer as well, as to not get on his bad side. Asmodeus telekinetically drags Drexel to him, and begins choking him for insinuating that he has enough of a relationship with Lucifer to speak that way, revealing how he got his scars and the deep bond it created between him and Lucifer. He tells Drexel because of that, he is Lucifer's humble servant and his to command, much like Drexel is for him. This page was last edited on 25 October 2017, at 11:14.